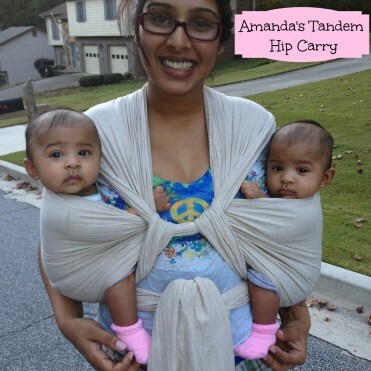 Tandem babywearing can be easy as 1-2-3 if you know what your options are! You can wear 2 babies together in the early days* up until it is no longer an option for you. (And tandem wearing is not limited to just twins! You can wear sibling/different size babies together!) When working on mastering tandem babywearing, keep in mind that most of these carries/methods have a "one baby" variation. Practice those if you find yourself stuck here. Visit my Babywearing Basics page for more info. There are so many different ways that you can wear your babies and it can be easy to feel overwhelmed when you first peep into the babywearing world. Have no fear. Think about this like shoe shopping. There are LOTS of different styles, sizes, colors/prints, etc. Different ones for different occasions/outings. And each option can fit different people differently. Below you can find more information about different carriers and carries you can snuggle your baby in. *if you have premature babies, please consult with your physician before wearing. Thing such as muscle tone, low birth weight, etc. can play a factor in safety.